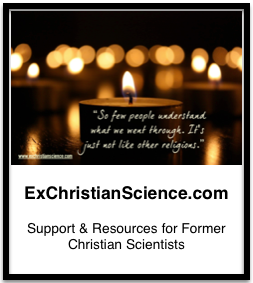 If Christian Science had evolved more on its science side than just its religious side, the evolution could have both saved Christian Science and kept it in correlation with the changes in society. Going deeper than belief would also have been more of a “check and balance” on how we make some decisions, some of which have come back to haunt us. We are going to have to agree to disagree, because I don’t think we are ever going to see eye-to-eye on this issue. Christian Science is a branch of Quimbyism and the New Thought movement which is not “scientific” by any stretch. I highly recommend reading Each Mind a Kingdom (I reviewed it a little while back) for more information on the formation of the movements and the social/political/gendered issues that it arose from. I have attended a Quimby group gathering once. I think that there are linguistic similarities. Some of the same terms have different definitions. It’s seems fair to say that Mrs. Eddy got several ideas in terminology from Quimby. Also, she had to be impressed with his healing ability, as she walked with him from patient to patient as he healed them with his style of treatment. Quimby was MBE’s mentor. She absorbed something. I think it’s Arthur Corey who has an unpublished quote of Mrs. Eddy’s where she says in effect that two of the important rivers of thought that helped to pull together her system came from Quimby and from Homeopathy. I don’t see how one could disagree with the statement I made that had Christian Science gone more in the scientific path that it could have saved itself as well as been an improved form of itself. What is the disagreement? Christian Science was supposed to be a nexus between Christianity and Science rather than religious conservatism. On another page on your website is this notation…. Gill’s assertions of poor scholarship are not entirely incorrect, as her claims are extensively footnoted. The main point of contention being that The Quimby Manuscripts, were not published by Horatio Dresser until 1921, by which point P.P. Quimby had been dead for over 50 years, and Christian Science was well established and thriving. Furthermore, they had not been given directly to Dresser, but had instead passed through several others before arriving with him (Gill, 121). Gill’s further research shows Dresser omitted papers that were not favorable to Quimby (Gill, 138) — the fact that the early Church attempted to suppress some of Ms. Eddy’s early work seems lost on her (Fraser , 142). In July, I attended the Noetic Sciences bi-annual meeting. Noetic Science was begun by astronaut Edgar Mitchel. Noetic has a staff of 13 credentialed scientists working on various consciousness projects. Some of the consciousness projects involve tracked studies of a few alternate healing methods. The placebo effect was tracked separately from the effects of the consciousness healing. Neotics uses the term “spiritual” which granted is a vague term. Even so, there are some studies that are paradigm changers or at least making some people consider that there is more to fixed matter as the end of all scientific inquiry. Fringe scientists doing science is still doing science. Amateur scientists doing science is still doing science. Charles Steinmetz said the Mrs. Eddy definition of electricity was the best definition he ever heard. It’s horrible that Christian Scientists didn’t investigate being scientific about their extreme beliefs. We all know the disasters that follow being too religious without checks and balances. There tends to be a prejudice or preconception that only large scientific institutions can do anything truly scientific. Look at the inventions that have come from the nerds in ham radio experimentation, for example. Look at the random number experiments that originated with the far-out fringe experimenters at the Duke University Rhine Institute. Today, there has accumulated enough data to show that randomness can be altered by directed thoughts. That theory about randomness used to be considered a scientifically insane claim to make.